"Maiwar" redirects here. For the state electoral district, see Electoral district of Maiwar. Brisbane River, showing the Story Bridge and the CBD. 13,600 km2 (5,300 sq mi)approx. 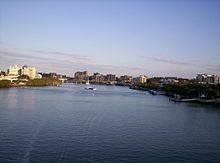 The Brisbane River (indigenous name Maiwar) is the longest river in South East Queensland, Australia, and flows through the city of Brisbane, before emptying into Moreton Bay. John Oxley, the first European to explore the river, named it after the Governor of New South Wales, Sir Thomas Brisbane in 1823. The penal colony of Moreton Bay later adopted the same name, eventually becoming the present city of Brisbane. Early travellers along the waterway admired the natural beauty, abundant fish and rich vegetation along its banks. From 1862 the Brisbane River has been dredged for navigation purposes. The river served as an important carriageway between Brisbane and Ipswich before a railway linking the towns was built in 1875. By the late 1920s, water quality in the river had significantly deteriorated. The river travels 344 km (214 mi) from Mount Stanley. The river is dammed by the Wivenhoe Dam, forming Lake Wivenhoe, the main water supply for Brisbane. The waterway is a habitat for the rare Queensland lungfish, Brisbane River cod and bull sharks. The largest ship built on the river was the Robert Miller. The 66,000 tonne vessel became un-moored in the 1974 Brisbane flood. While not the highest experienced along the river since European settlement, this flood was the most damaging. Major floods also occurred in January 2011 and multiple times during 1893. Extensive port facilities have been constructed on the Fisherman Islands, now known as the Port of Brisbane. There are 16 major bridges that cross the river. The Clem Jones Tunnel, opened in 2010, is the river's first underground crossing for road transport. The CityCat ferry service collects and delivers passengers along the inner-city reaches of the river. Course of the lower reaches of the Brisbane River from Ipswich to Moreton Bay. Brisbane River's source is located in the Great Dividing Range, east of Kingaroy. It then makes its way south, past Mount Stanley, and townships including Moore and Toogoolawah before being joined by the Stanley River, just south of Somerset Dam. The river runs from there into Lake Wivenhoe, created by the Wivenhoe Dam. Beyond the dam, the river meanders eastward, meeting the Bremer River near Ipswich, then making its way through Brisbane's western suburbs, including Jindalee, Indooroopilly and Toowong. 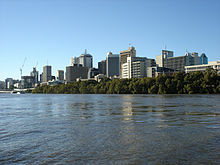 The river is traversed by CityCats and other ferries in Brisbane, as it winds its way through the city centre. Water from the highest point in the catchment has fallen from Mount Langley in the Conondale Range, 868 m above sea level. The Brisbane River then flows past wharves including Pinkenba Wharf and Portside Wharf, past Bulwer Island and Luggage Point through the Port of Brisbane and into southern Bramble Bay an embayment of Moreton Bay. On the southern side of the river, opposite Gardens Point, are the Kangaroo Point Cliffs; made from Triassic aged volcanic rock of rhyolite composition called Brisbane tuff. The Kangaroo Point Cliffs were created by a quarrying operation that, according to Allan Cunninghams' Field Book, was underway prior to 1829 when he observed a "stone wharf presumably used for landing the blocks of stone ferried across the river for the construction of buildings in the settlement". This was in the vicinity of Edward Street ferry terminal. The volcanic rock Ignimbrite which formed the cliffs was deposited in the Triassic period about 220 million years ago. They currently form the banks of the Brisbane River. The following major tributaries flow into the Brisbane River from the north; Breakfast Creek, Moggill Creek and the Stanley River. 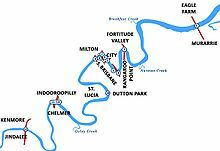 On the southside Bulimba Creek, Norman Creek, Oxley Creek, Bremer River and Lockyer Creek waterways enter the Brisbane River. The following smaller creeks also flow into the river; Cressbrook Creek, Cooyar Creek, Cubberla Creek, Black Snake Creek, Wolston Creek, Woogaroo Creek, Goodna Creek, Six Mile Creek, Pullen Pullen Creek and Kholo Creek. 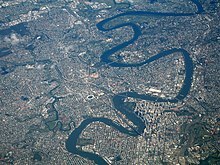 Aerial view of Brisbane and the Brisbane River. The Brisbane River a short distance downstream of Wivenhoe Dam near Fernvale, while the spillway is open. Before European settlement, the Brisbane River was spiritually important and a vital food source for the Aboriginal people of the Turrbal nation, primarily through fishing in the tidal sections downstream, with fishing and firestick farming in the upper reaches where there was freshwater, depending on the season. The language group common to most of the area was the Yugarabul language group. On 21 March 1823, four ticket-of-leave convicts sailing south from Sydney on a timber getting mission to Illawarra, Thomas Pamphlett, John Finnegan, Richard Parsons and John Thompson were blown north by a storm. They went 21 days without water, continuing north in the belief they had been blown south, during which time Thompson died. They landed on Moreton Island on 16 April and made it to the mainland on the south of the Brisbane River. They immediately began trekking north in order to return to Sydney, still believing themselves to be somewhere south of Jervis Bay. Subsequently, they became the first known Europeans to discover the river, stumbling across it somewhere near the entrance. They walked upstream along its banks for nearly a month before making their first crossing at 'Canoe Reach', the junction of Oxley Creek. It was here they stole a small canoe left by the Australian Aborigines of the region. "We rounded the Point Skirmish about 5 o'clock and observed a number of natives running along the beach towards the vessel, the foremost much lighter in colour than the rest. We were to the last degree astonished when he came abreast the vessel to hear him hail us in good English." By that time Pamphlett and Finnegan were living with natives near Bribie Island. Parsons, who had continued to travel north in search of Sydney, was picked up by Oxley on 11 September 1824. On 2 December 1823, Oxley and Stirling, with Finnegan as a somewhat reluctant guide, entered the river and sailed upstream as far as present-day Goodna. :191 Oxley noted the abundant fish and tall pine trees. Early European explorers marvelled at the sheer natural beauty they witnessed while travelling up the lower reaches. Reports by early European explorers such as Allan Cunningham and Oxley indicate rainforest once fringed the Brisbane River and its major tributaries, especially on the broader floodplains such as St Lucia and Seventeen Mile Rocks. The coastal lowlands were extensively vegetated with Melaleuca woodlands in low lying, poorly drained coastal areas. When first described by Europeans, the lower reaches of the Brisbane River were fringed by a mosaic of open forest, closed forest and rainforest. The entrance to the Brisbane River was surveyed and marked with buoys in May 1825 by Pilot John M Gray sent from Sydney for the purpose by Governor Sir Thomas Brisbane. Pilot John M Gray also transferred the soldiers and convicts from the First Settlement at Redcliffe at this time. From 1862 the Brisbane River has been dredged for navigation purposes. Throughout much of the 20th century large quantities of sand and gravel were extracted from the estuary of the river. Since the rate of materials being deposited is not as high as that which was removed, the river has acted as a subaqueous mine. In 1866 there was a breakwater built at the junction of the Bremer and Brisbane rivers that was designed to stop shingle from blocking the access to the Bremer's boat channel. The first pile light using kerosene was built in 1882.:198 The steel framed light also served as an early port signal station. Brisbane River, from Victoria Bridge, showing Goodwill Bridge and a CityCat ferry. On 25 March 1941, a USA goodwill flotilla arrived in the city docking at wharves along the River. :25 The largest ship built on the river was the Robert Miller. Construction was near complete when the 66,000 tonne vessel became un-moored in the 1974 Brisbane flood. In 1977, Queen Elizabeth II switched on the Jubilee Fountain positioned in front of the proposed Queensland Cultural Centre. The jets pushed the floodlit river water up to 75 m (246 ft) in the air. The floating fountain sank late on the 31 December 1984. 1987 was proclaimed the "Year of the River" by the Lord Mayor of Brisbane at the time, Sallyanne Atkinson. A NASA image of the 2011 flood. The top of the photo is oriented approximately to the southwest. The light-coloured rooftops of residences and other structures contrast sharply with green vegetation and brown, sediment laden flood-waters. Most visible low-lying areas are inundated by flood-water, perhaps the most striking being Rocklea (upper left). Yeronga (lower left) also has evident regions of flooding, as does a park and golf course located along a bend in the Brisbane River to the south of St Lucia (centre). Flooding becomes less apparent near the higher elevations of Mount Coot-tha (right). The Brisbane River floods frequently, although the occurrence and magnitude of flooding has diminished following the construction of the Wivenhoe Dam on the upper reaches of the River. Past floods have resulted in both deepening and reduction in river depth, creation of new sand banks and shoals as well as increased transport of suspended sediment from upstream. Before the invention of modern dredging techniques the sediment deposited by flooding created hazards to ships navigating the river. Even medium-sized vessels no longer travel up the Brisbane River beyond the city reach, and dredging of the upper reaches has ceased, allowing the river to recover substantially from the fine silt dislodged by gravel and sand extraction. 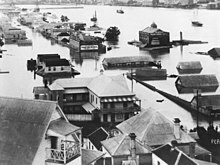 February 1893, a sequence of flood peaks (8.35 metres and 8.09 metres) over two weeks saw the highest recorded flood level in the Brisbane central business district. Seven lives were lost in the Eclipse Colliery at North Ipswich as a direct result of the flooding. Several other lives were lost to drownings. Flooding along the Brisbane River has the potential to be devastating, as documented in 1974 and 2011. For much of the river's length its banks are relatively high, but topped by a broad plain. The river's meandering course means that flood waters from upstream cannot be quickly discharged into Moreton Bay. Thus higher than normal flows cause river levels to rise rapidly and once the top of the banks are breached the floodwaters can spread over wide areas of the city. The river depth was progressively increased and narrow points widened to allow larger vessels into the river and further upstream. For navigation and safety reasons the Seventeen Mile Rocks were completely removed in 1965 after numerous partially successful attempts in the past. The northern river bank at the mouth of the river has undergone reclamation projects over the years, especially in the suburbs of Hamilton and Pinkenba. More recently, extensive port facilities have been constructed on Fisherman's Island which has also seen significant land reclamation into the bay. Early rivers crossings were made using small oared boat ferries, beginning in 1843,:5 followed by steam ferries. In 1865 the first Victoria Bridge, later destroyed in a flood, was built across the river. 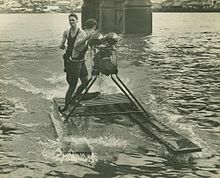 Professor Hawken of the University of Queensland undertook a study in 1914 to identify the future crossing points for the river. Historically, the Brisbane River contained upstream bars and shallows and had a natural tidal limit of only 16 km (10 mi). The current tidal limit now extends 85 km (53 mi) upstream due to continual channel dredging. The first bridge built across the Brisbane River was the original timber Victoria Bridge, opened in 1865 between Brisbane and South Brisbane. The current concrete Victoria Bridge is the 4th to be built on the site, the original bridge collapsed after marine borers weakened its timber piles, and the second was destroyed in the 1893 flood. As of 2012[update] the Brisbane River is crossed by 16 major bridges (counting the new second Gateway, now Sir Leo Hielscher Bridge), including the historic 1940 Story Bridge and the tolled Sir Leo Hielscher Bridges. There are two other major bridges upstream (west) of Brisbane, on the D'Aguilar Highway and the Brisbane Valley Highway. The Clem Jones Tunnel, opened in 2010, is the river's first underground crossing for road transport. The Moggill Ferry continues to provide a crossing for vehicles northeast of Ipswich. The Albert Bridge was the first railway crossing of the Brisbane River, opened in 1876. It was destroyed in the 1893 flood and replaced by a 2 span design that is flood tolerant. A second bridge was built adjacent to it, opened in 1957 in conjunction with the quadruplication of the railway between Roma Street and Corinda. The Merivale Bridge, opened in 1978, connects the South Brisbane railway system to the City. Four bridges have been built that cater for pedestrians and bicycles, being the Goodwill Bridge and Kurilpa Bridge in the City area, the Eleanor Schonell Bridge between Dutton Park and St Lucia (which also caters for public buses to the University of Queensland St Lucia campus), and the Jack Pesch Bridge between Indooroopilly and Chelmer. The Brisbane City Council has announced plans for a pedestrian and cycle only bridge between Kangaroo Point and the city. The Brisbane City Council has developed a network of riverwalk pavements along the banks of the Brisbane River. Jim Soorley, a former mayor of Brisbane, encouraged serious investment into the quality and capacity of the Brisbane riverwalk. An interesting section is the floating walkway between the Story Bridge and Merthyr Street New Farm. Brisbane City planners require many developers of formerly private riverfront blocks to create new sections of the Brisbane Riverwalk that are accessible to the public. During the 2011 floods, the Lord Mayor of Brisbane, Campbell Newman authorised the destruction of the Brisbane Riverwalk to prevent it floating away and becoming a hazard downstream. The proposed demolition of the Riverwalk was later cancelled. Early in the morning of 13 January 2011 a several hundred metre long section of the Riverwalk broke away from the main structure and floated downstream. Queensland Police temporarily closed the Sir Leo Hielscher Bridges (commonly known as the Gateway Bridge) several times as there were fears that sections of Riverwalk could collide with and damage the bridge. The largest part of the floating boardwalk was safely guided under the bridge by a tugboat and past other infrastructure before being safely secured. Other tugs and Water Police guided other Riverwalk sections under the bridge. The damaged Riverwalk was rebuilt as a fixed structure by the Brisbane City Council. The 18-month construction commenced in early 2013 and was completed in September 2014. The Clem Jones Tunnel is currently the only cross river tunnel built in Brisbane. It opened on 16 March 2010. During the 19th century and early 20th century, the river's surface was periodically choked by large swathes of the noxious weed known as water hyacinth. The plant was originally imported from South America. Environmentally, the river is in a poor condition and has been so for many years. In 2000, the Brisbane River estuary did not meet the national guidelines for environmental standards. The lower reaches received a very poor rating in the 2008 Healthy Waterways report, an annual assessment of river water quality. The major causes of pollution are excess nutrients, hydrocarbons, pesticides and bacteria which become concentrated in the river and its sediment after flowing off surrounding lands. The river is also considered too murky and it is not recommended to swim in its waters. Historically, the river was actively dredged by Boral Sands Inc, ostensibly to make the river navigable. The constant extraction of river bed material by dredges has had considerable effect on the river. These impacts include increased turbidity, bed and bank erosion and changes in tidal hydraulics. The tidal nature of the river and the generally muddy nature of the sands removed by dredging created a woefully sludgy clayey sediment load in the river which did not clear. The efficacy of dredging the river upstream of the city reach to make it "navigable" was always in doubt, and the effect of the artificial sediment load in Moreton Bay grew to concern environmentalists worried that sediment was choking sea grass paddocks which were grazing territory for dugong. In a meeting concerning the matter in October 1996, including two State Government Ministers and three Mayors, an agreement to cease the dredging of sand and gravel from the river by 30 September 1997 was formed. Boral Resources Pty. Ltd. resisted the agreement, but ultimately all dredging was stopped by the agreed date. The river has several important ecological areas where remnant populations of mangroves exist; these include areas around drainage culverts, in Breakfast Creek, New Farm, a small preserve at the city bend, near the Queensland University of Technology and around the shipping terminals at the river's terminus into Moreton Bay. These mangroves have recently become classified as protected nature reserves. The noxious water hyacinth weed is still growing in stretches between Fernvale and the Mount Crosby Weir but only poses a minimal risk to drinking water supplies. In 1895-1896, the Queensland lungfish was only found in the Mary and Burnett river systems. Concerned about the species survival, it was introduced into other Queensland waterways with varying success. Self-sustaining populations of lungfish were successfully estaglished in the Brisbane River, the Enoggera Reservoir and the North Pine River. The freshwater reaches of the Brisbane River once supported a unique species of cod, the Brisbane River cod, which was similar to Murray cod and closely related to eastern freshwater cod and Mary River cod. Unfortunately this unique native fish became extinct somewhere between the 1930s and 1950s due to habitat degradation and overfishing. The river has been restocked with cod from the Mary River. The Brisbane River is home to a very large population of bull sharks, thus swimming is not advised due to the dangers imposed by this predator. Ipswich City Council warns against swimming as far up as Colleges Crossing. There have been four recorded shark attack deaths in the river (1862, 1880, 1901 and 1921), and numerous other fatal attacks in surrounding rivers and estuaries. There have also been numerous attacks on family pets, such as dogs.Bull sharks can be aggressive, grow up to between 7-11.5 feet (2.1-3.5 m) in length and are unusual for a shark species because they can inhabit brackish water (containing less than 50% seawater). The Brisbane River hosts numerous events including the Riverfestival, Riverfire, and the Brisbane River Classic fishing competition. Many schools and clubs use the river to conduct rowing regattas on Milton Reach. Sailing regattas are also held on this reach as well as the Hamilton reach. Riverfestival, which began in 1998, was a week-long festival held in September each year at South Bank Parklands and surrounding areas (including the Victoria Bridge), to celebrate the Brisbane River. In 2009, the festival merged with Brisbane Festival. Riverfire, which is held at the end of the Brisbane Festival, includes a fireworks display. The final dump-and-burn of Riverfire 2010 was able to be seen as far as the Gold Coast and Toowoomba as the F-111 climbed from 300 ft (91 m) to a higher altitude of about 10,000 ft (3,000 m). In 2009 as part of the Q150 celebrations, Riverfire was announced as one of the Q150 Icons of Queensland for its role as an "Events and festivals". There are several options about Brisbane River Sports (Kayak: Daily, Night or Sunset Paddle) and Cruises(Morning, Afternoon or daily). The details can be available on Brisbane visitor information web site. 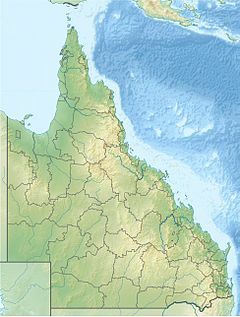 The electoral district of Maiwar created in the 2017 Queensland state electoral redistribution was named after the river's indigenous name. 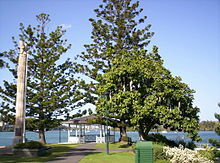 ^ Brisbane Sunshine Coast (Map) (Fourteenth ed.). Royal Automobile Club of Queensland. July 2002. ^ "Dalys Reach - reach in the City of Brisbane (entry 48211)". Queensland Place Names. Queensland Government. Retrieved 11 December 2017. ^ "Moggill Reach - reach in City of Ipswich (entry 48208)". Queensland Place Names. Queensland Government. Retrieved 11 December 2017. ^ "Redbank Reach - reach in the City of Brisbane (entry 48207)". Queensland Place Names. Queensland Government. Retrieved 11 December 2017. ^ "Goodna Reach - reach in City of Ipswich (entry 48204)". Queensland Place Names. Queensland Government. Retrieved 11 December 2017. ^ "Cockatoo Reach - reach in the City of Brisbane (entry 48203)". Queensland Place Names. Queensland Government. Retrieved 11 December 2017. ^ "Goggs Reach - reach in the City of Brisbane (entry 48202)". Queensland Place Names. Queensland Government. Retrieved 10 December 2017. ^ "Popes Reach - reach in the City of Brisbane (entry 48201)". Queensland Place Names. Queensland Government. Retrieved 10 December 2017. ^ "Pullen Reach - reach in the City of Brisbane (entry 48200)". Queensland Place Names. Queensland Government. Retrieved 10 December 2017. ^ "Two Mile Reach - reach in the City of Brisbane (entry 48199)". Queensland Place Names. Queensland Government. Retrieved 10 December 2017. ^ "Mount Ommaney Reach - reach in the City of Brisbane (entry 48198)". Queensland Place Names. Queensland Government. Retrieved 11 December 2017. ^ "Mermaid Reach - reach in the City of Brisbane (entry 21660)". Queensland Place Names. Queensland Government. Retrieved 22 January 2015. ^ "Sherwood Reach - reach in the City of Brisbane (entry 48206)". Queensland Place Names. Queensland Government. Retrieved 11 December 2017. ^ "Chelmer Reach - reach in the City of Brisbane (entry 6977)". Queensland Place Names. Queensland Government. Retrieved 22 January 2015. ^ "Indooroopilly Reach - reach in the City of Brisbane (entry 16669)". Queensland Place Names. Queensland Government. Retrieved 22 January 2015. ^ "Canoe Reach - reach in the City of Brisbane (entry 6090)". Queensland Place Names. Queensland Government. Retrieved 22 January 2015. ^ "Long Pocket Reach - reach in the City of Brisbane (entry 20015)". Queensland Place Names. Queensland Government. Retrieved 22 January 2015. ^ "Cemetery Reach - reach in the City of Brisbane (entry 6769)". Queensland Place Names. Queensland Government. Retrieved 22 January 2015. ^ "St Lucia Reach - reach in the City of Brisbane (entry 32110)". Queensland Place Names. Queensland Government. Retrieved 22 January 2015. ^ "Toowong Reach - reach in the City of Brisbane (entry 34969)". Queensland Place Names. Queensland Government. Retrieved 22 January 2015. ^ "Milton Reach - reach in the City of Brisbane (entry 22137)". Queensland Place Names. Queensland Government. Retrieved 22 January 2015. ^ "South Brisbane Reach - reach in the City of Brisbane (entry 31435)". Queensland Place Names. Queensland Government. Retrieved 22 January 2015. ^ "Town Reach - reach in the City of Brisbane (entry 35068)". Queensland Place Names. Queensland Government. Retrieved 22 January 2015. ^ "Petrie Bight - reach in the City of Brisbane (entry 26538)". Queensland Place Names. Queensland Government. Retrieved 22 January 2015. ^ "Shafston Reach - reach in the City of Brisbane (entry 30553)". Queensland Place Names. Queensland Government. Retrieved 22 January 2015. ^ "Humbug Reach - reach in the City of Brisbane (entry 16437)". Queensland Place Names. Queensland Government. Retrieved 22 January 2015. ^ "Bulimba Reach - reach in the City of Brisbane (entry 4985)". Queensland Place Names. Queensland Government. Retrieved 22 January 2015. ^ "Hamilton Reach - reach in the City of Brisbane (entry 15283)". Queensland Place Names. Queensland Government. Retrieved 22 January 2015. ^ "Quarries Reach - reach in the City of Brisbane (entry 27755)". Queensland Place Names. Queensland Government. Retrieved 22 January 2015. ^ "Lytton Reach - reach in the City of Brisbane (entry 20323)". Queensland Place Names. Queensland Government. Retrieved 22 January 2015. ^ "Quarantine Flats Reach - reach in the City of Brisbane (entry 43393)". Queensland Place Names. Queensland Government. Retrieved 22 January 2015. ^ "Upper Black Snake Creek Improvement Summary" (PDF). Ipswich City Council. 2005. Archived (PDF) from the original on 2016-03-25. Retrieved 2017-03-09. ^ Gregory, Helen (1996). The Brisbane River story : meanders through time. Australian Marine Conservation Society. ISBN 0-646-30132-2. ^ Gray, Nancy (1966). "Bingle, John (1796–1882)". Australian Dictionary of Biography. Archived from the original on 7 August 2011. Retrieved 16 March 2010. ^ Fisher, Rod (June 2007). "Linking Heritage – Up, Down and Around the Brisbane River" (PDF). Brisbane's Living Heritage Network. Archived from the original (PDF) on 24 July 2011. Retrieved 16 March 2010. ^ The Life of Captain Matthew Flinders, R.N. ^ a b c d e f McLeod, G. Roderick (1990). Davie, Peter; Stock, Errol; Low Choy, Darryl (eds.). Some aspects of the History of the Brisbane River. The Brisbane River: a source-book for the future. Australian Littoral Society in association with the Queensland Museum. ^ a b Young (1996). 1990 Task M2 State of the Brisbane River and Moreton Bay and Waterways. Gutteridge, Haskins & Davey Pty Ltd. pp. 6–8. ^ a b c d e f Longhurst, Robert; Douglas, William (1997). The Brisbane River: A pictorial history. Brisbane: W. D. Incorporated Pty. Ltd.
^ Erskine, Wayne (1990). Davie, Peter; Stock, Errol; Low Choy, Darryl (eds.). Environmental Impacts of sand and gravel extraction on river systems. The Brisbane river: a source-book for the future. Australian Littoral Society in association with the Queensland Museum. pp. 295–302. ^ a b c "Anglers still hooked on Brisbane River". Courier Mail. Queensland Newspapers. 22 January 2009. Archived from the original on 31 December 2012. Retrieved 2009-10-25. ^ McBride, Frank; et al. (2009). Brisbane 150 Stories. Brisbane City Council Publication. pp. 250–251. ISBN 978-1-876091-60-6. ^ Hogan, Janet (1982). Living History of Brisbane. Spring Hill, Queensland: Boolarang Publications. p. 128. ISBN 0-908175-41-8. ^ "Sunken fountain pumped up for return to public duty". The Age. Fairfax Media. 4 January 1985. Retrieved 29 October 2015. ^ Hubert Chanson (2011). "The 2010–2011 Floods in Queensland (Australia): Observations, First Comments and Personal Experience". La Houille Blanche. Paris: Societe Hydrotechnique de France (1): 5–11. ISSN 0018-6368. ^ Holland, I.; Maxwell, O.; Grice, A. (2002). "Chapter 12". Tidal Brisbane River. State of South-east Queensland Waterways Report 2001. Brisbane, Australia: Moreton Bay Waterways and Catchments Partnership. pp. 75–82. ^ "Brisbane Riverwalk". Must do Brisbane. Archived from the original on 2018-04-02. Retrieved 12 November 2018. ^ Atfield, Cameron (12 January 2011). "Brisbane Riverwalk 'a dangerous missile'". Brisbane Times. Retrieved 12 January 2011. ^ a b Vogler, Sarah; O'Brien, Jodie Munro; Caldwell, Anna (13 January 2011). "Skipper tells how tug boats saved Gateway bridges from collision with runaway Riverwalk debris". Courier-Mail. Archived from the original on 2 September 2012. Retrieved 13 January 2011. ^ "Council announces new Brisbane Riverwalk plan". ABC News. 10 November 2011. Archived from the original on 11 November 2011. Retrieved 29 March 2012. ^ "Brisbane's RiverWalk reconstruction gets advance funding". Urban analyst. 12 November 2011. Archived from the original on 5 May 2015. Retrieved 3 August 2015. ^ "Riverwalk replacement project". Brisbane City Council. Archived from the original on 14 March 2014. Retrieved 3 August 2015. ^ Meadows, Jane (1994). Brisbane's Western Suburbs: our heritage in focus. State Library of Queensland Foundation. p. 87. ISBN 0-7242-6077-3. ^ South East Queensland Regional Strategic Group (2000). Strategic Guide to Natural Resource Management in South East Queensland. p. 56. ISBN 0-7345-1740-8. ^ "Western Catchments". Healthy Land & Water. Archived from the original on 14 March 2017. Retrieved 13 March 2017. ^ Johnstone, Craig (22 July 1995). "How we're slowly killing our river". The Courier-Mail – Weekend. p. 1. ^ Moore, Tony (8 February 2008). "Choking weed threatens Brisbane's water supply". Brisbane Times. Fairfax Digital. Archived from the original on 25 October 2008. Retrieved 16 November 2009. ^ "The unique Australian Lungfish". Queensland Museum. Archived from the original on 2018-09-06. Retrieved 12 November 2018. ^ Anon. (2004). New South Wales Eastern (Freshwater) Cod (Maccullochella ikei) Recovery Plan. New South Wales Department of Fisheries, Port Nelson, New South Wales, Australia. ^ Rowland, S.J. (1993) Maccullochella ikei, an endangered species of freshwater cod (Pisces: Percichthyidae) from the Clarence River System, NSW, and M. peelii mariensis, a new subspecies from the Mary River System, QLD. Records of the Australian Museum 45: 121–145. ^ 'Sharks vs Dogs in the Brisbane River' Archived June 14, 2015, at the Wayback Machine. ^ "Brisbane River sharks net international interest". UQ News. University of Queensland. 20 February 2002. Archived from the original on 10 June 2011. Retrieved 2009-10-25. ^ Sorensen, Rosemary (2009-09-14). "Festival kicks off with a bang". The Australian. p. 19. ^ Shorten, Kristin (28 July 2010). "Final hurrah for dinosaurs of the sky at Riverfire". The Courier Mail. p. 17. ^ Queensland Redistribution Commission (26 May 2017). "Determination of Queensland's Legislative Assembly Electoral Districts" (PDF). Queensland Government Gazette. p. 187. Archived (PDF) from the original on 29 October 2017. Retrieved 29 October 2017. Department of Harbours and Marine (1986). "Harbours and Marine" Port and Harbour Development in Queensland from 1824 to 1985, p. 25. Queensland Government Department of Harbours and Marine. Steele, J. G. (1975). Brisbane Town in Convict Days 1824-42. Brisbane, Queensland: University of Queensland Press. pp. 1–118. 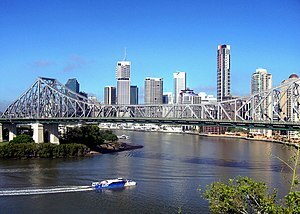 Wikimedia Commons has media related to Brisbane River.